Background and objectives: The value of a complete remission in severe lupus nephritis is well known but little is known about the impact of a partial remission in this patient population. The purpose of this study was to evaluate the long-term prognosis of achieving a complete or partial remission in a well-defined group of patients with severe lupus nephritis. Design, setting, participants, & measurements: In this study, 86 patients with diffuse lupus glomerulonephritis were reviewed for assessment of the value of a partial remission (50% reduction in baseline proteinuria to ≤1.5 g/d and ≤25% increase in baseline creatinine) and complete remission (proteinuria ≤0.33 g/d and serum creatinine ≤1.4 mg/dl) on outcomes compared with patients who did not attain a remission. These well-characterized patients were entered into a prospective therapeutic trial conducted by the Collaborative Study Group and were followed for more than 10 yr. Results: All biopsies showed diffuse lupus nephritis. A complete remission was attained in 37 (43%) patients, a partial remission in 21 (24%) patients, and no remission in 28 (32%) patients. Baseline clinical and serologic features were similar among the groups, but patients with a complete remission had a lower serum creatinine and chronicity index compared with patients with partial or no remission. The patient survival at 10 yr was 95% for complete remission, 76% for partial remission, and 46% for no remission. The renal survival at 10 yr was 94% for complete remission, 45% for partial remission, and 19% for no remission, and the patient survival without end-stage renal disease at 10 yr was 92% for complete remission, 43% for partial remission, and 13% for no remission. Conclusion: Even a partial remission in lupus nephritis is associated with a significantly better patient and renal survival compared with no remission. In severe lupus nephritis, a significant correlation between response to aggressive immunosuppressive treatment as measured by a reduction or remission in proteinuria and outcomes has been demonstrated (1–6). As a result, the use of remission as a short-term outcome has been suggested as a valid measure when designing future studies given the ability to predict long-term outcomes that generally are used, such as ESRD, doubling of serum creatinine, and death (1). The majority of studies that assessed response to treatment in patients with severe lupus nephritis focused on outcomes based on attaining a complete remission (CR) (2,6–9). Although the definition of a CR can vary considerably from study to study (1), we previously showed that when strictly defining a CR as a normalization in proteinuria and serum creatinine, patients who attained a CR with aggressive immunosuppressive treatment had significantly better patient and renal survivals than nonresponders (6). Little is known, however, of the outcomes in patients who have severe lupus nephritis and are unable to attain a normalization of renal parameters but have a partial response to therapy with a reduction in proteinuria and stabilization in renal function. In other forms of glomerular disease, attaining a “partial remission” (PR) has resulted in significant improvement in renal outcomes (10,11). Whether a similar experience can be observed in patients with severe lupus nephritis is unknown. The purpose of this study was to evaluate the long-term prognosis of achieving a PR in a well-defined group of patients with severe lupus nephritis. The 86 adult patients who participated in the prospective, controlled trial of plasmapheresis in severe lupus nephritis that was conducted from April 1981 to December 1988 compose the study group (12). Because there were no significant differences between the two treatment groups during the therapeutic trial, the patient data were pooled for this study (12). During the course of the study, 37 (43%) patients entered a CR, 21 (24%) entered a PR, and 28 (33%) were nonresponsive to therapy. The entry criteria, therapeutic and medical management protocols, and results of the initial study have been previously described (12,13). In brief, patients were eligible when they were ≥16 yr of age, had systemic lupus erythematosus as defined by the American Rheumatism Association (14), and had biopsy-proven severe lupus nephritis. Patients with a serum creatinine >6 mg/dl, previous plasmapheresis, or pregnancy were excluded from the study. Entry criteria (12) required the histologic diagnosis of severe lupus nephritis, and the histologic diagnosis was determined prospectively by the Pathology Reading Committee of the Lupus Nephritis Collaborative Study Group (see the acknowledgments), using a modification of the 1982 World Health Organization (WHO) classification of lupus nephritis (15–17). An adequate biopsy contained >10 nonsclerotic glomeruli, and the diagnosis of severe lupus nephritis was based on the presence of proliferation and/or necrosis in ≥50% of the glomeruli with or without concomitant membranous glomerulonephritis (12). This pathologic rubric comprises three morphologically discrete forms of lupus glomerulonephritis: (1) segmental glomerulonephritis with active and/or necrotizing lesions in ≥50% of glomeruli (category III ≥50% ; 24 patients), (2) diffuse glomerulonephritis (category IV ; 35 patients); and (3) membranous glomerulonephritis with superimposed severe segmental (≥50% glomerular involvement, category Vc: ≥50%; 20 patients) or diffuse proliferative glomerulonephritis (category Vd; six patients). One patient was not classifiable. The activity index (maximum score of 24 points) and chronicity index (maximum score of 12 points) were determined by the Pathology Reading Committee for each biopsy (17–19). Because we previously showed that the prognosis of these lesions is defined by the distribution of their proliferative component (segmental versus global inflammation), we grouped them accordingly into category III ≥50% (44 patients) and category IV (41 patients) (20). These histologic classes are similar to class IV-S (segmental) ± V and IV-G (global) ± V in the classification proposed by the International Society of Nephrology and Renal Pathology Society (ISN/RPS) (21,22), but there are important differences. In the classification used by the Lupus Nephritis Collaborative Study Group (15–17), a segmental lesion (class III ≥50%) can involve anywhere from 50% of glomeruli to all of the glomeruli in the biopsy, and there was no upper limit to the extent of involvement within each glomerulus. In contrast, the ISN/RPS classification relegates biopsies with segmental lesions that involve >50% of the glomerular tuft to class IV-G. As a result, inclusion of very widely distributed segmental lesions to ISN/RPS class IV-G could easily conceal differences in outcomes between patients with class IV-S and IV-G. Because this article addresses critical differences in outcomes in segmental and diffuse glomerular lesions on the basis of remission status, we continue to use the original classification. Clinical, biochemical, and serologic information was obtained on patients at baseline and at specified follow-up times during the initial study. The study was terminated in March 1986, but patients were formally followed through December 1988 (12). Clinical follow-up has now been extended to June 1998. Information on current clinical status of the patients with respect to death, ESRD, and biochemical results for serum creatinine and urine protein were recorded. Baseline serum creatinine, C3 and C4 complement components, anti–double-stranded DNA antibodies (anti-dsDNA), C1q binding activity, and cryoglobulin concentrations were determined in a central laboratory as described previously (23). Serum creatinine was measured by a Creatinine Analyzer II (Beckman Instruments, Fullerton, CA) with the use of a modified alkaline picrate method. Serum C3 and C4 were measured by radial immunodiffusion (Calbiochem-Behring, La Jolla, CA), and anti-dsDNA was measured by RIA (Amersham, Arlington Heights, IL). Antibodies to Ro, La, nRNP, and Sm were determined by Dr. Morris Reichlin, MD (Oklahoma City, OK) using an ELISA with affinity-purified antibodies as described previously (24,25). The details of the treatment protocols for this study have been published previously (12,13). All patients initially received 60 mg/d prednisone orally and 2 mg/kg per d cyclophosphamide orally. Forty patients were randomly assigned to receive standard therapy plus plasmapheresis three times weekly for 4 wk in addition to this treatment. After the initial 4 wk of treatment, patients who improved clinically received cyclophosphamide at 1 mg/kg per d for an additional month, after which it was discontinued. The dosage of prednisone was gradually tapered over a 22-wk period to 20 mg on alternate days. Patients whose renal symptoms had worsened at 4 wk were continued on the initial high-dosage prednisone and cyclophosphamide for an additional 4 wk, and patients in the plasmapheresis arm of the study also received an additional 12 treatments. Thereafter, renal and extrarenal flares were treated on the basis of other standardized protocols of intensive drug therapy as described previously (13). The following outcomes were evaluated from the time of entry into the study: (1) Time to CR (serum creatinine of ≤1.4 mg/dl and proteinuria of ≤0.33 g/d within 5 yr of entering the study); (2) time to PR (a ≤25% increase in baseline creatinine and ≥50% reduction in baseline proteinuria to ≤1.5 g/d [but >0.33 g/d] within 5 yr of entering the study); (3) time to ESRD (defined by a serum creatinine of ≥6 mg/dl or the initiation of renal replacement therapy); and (4) time to death. Lupus renal flares were defined as moderate (a sudden increase in serum creatinine of >0.3 mg/dl or an increase in proteinuria of >1.0 g/d) or severe (a sudden increase in serum creatinine of >1 mg/dl [12,13]). Comparison of the clinical, laboratory, and pathologic characteristics used the χ2 test and Fisher exact test for categorical data and the Kruskal-Wallis test and Dunn multiple comparisons test for continuous data. For the analysis of length of time from entry to remission, ESRD (renal survival), death (patient survival), ESRD or death (patient survival without ESRD), product-limit life-table distributions were compared with the log-rank test statistic (26). Results are reported as mean ± SD, and P < 0.05 was considered significant. During the course of the study, 37 (43%) patients entered a CR, 21 (24%) entered a (PR), and 28 (33%) had no remission (NR). The baseline clinical and serologic characteristics on the basis of remission status are shown in Table 1. There were no significant differences in age, gender, black race, BP, level of proteinuria, or treatment among the groups at baseline; however, the serum creatinine at baseline was significantly different among the groups. The serum creatinine was highest in patients with NR compared with patients who went on to attain a CR or PR, and the serum creatinine was significantly lower in patients with CR compared with both patients with a PR and NR. There were no significant differences in serologic parameters among the groups at baseline (Table 2). The histologic features at biopsy are shown in Table 3. Whereas the proportion of patients with WHO III ≥50% and WHO IV lesions were not significantly different among the three groups, patients with CR were more likely to have category IV lesions than patients with PR or NR, and patients with NR were more likely to have WHO III ≥50% lesions compared with CR and PR patients. On the basis of WHO classification (IV versus III ≥50%), a CR was observed in 56 versus 32% of patients, a PR was observed in 20 versus 27% of patients, and there was no response in 24 versus 41% of patients (P = 0.07 overall). There were no differences in the activity index or the proportion of patients with an activity index ≥12 among the groups; however, the chronicity index and the proportion of patients with a chronicity index ≥4 was significantly lower in patients who achieved CR compared with both patients who attained a PR or NR. Patients with CR or PR had significantly longer lengths of follow-up compared with patients with NR (Table 4). The time to achieve a CR was more than twice that compared with patients who achieved a PR (Table 4, Figure 1). The proportion of patients who had renal flares was significantly less in patients with a CR compared with patients with a PR. At last follow-up, patients who entered a CR had a significantly greater proportion with stable renal function and significantly lower proportion who had progressed to ESRD or had a renal death (progressed to ESRD and then died) than both patients with PR or NR. In addition, more than twice as many patients with PR had stable renal function (29 versus 11%; P = 0.14) and half as many deaths (renal death + nonrenal death; 28 versus 54%, P = 0.14) compared with patients with NR, but this was not statistically different. Renal remission. Time to remission for patients who entered a complete remission (CR; median 10.5 mo) or partial remission (PR; median 5.8 mo; P = 0.0006). The renal survival (Figure 2) was significantly greater for patients wit CR and PR (median 100.9 mo) compared with patients with NR (median 17.8 mo; P < 0.0001 and P = 0.003, respectively). Renal survival for patients with CR was also significantly better than for patients with PR (P < 0.0001). The renal survival at 10 yr was 94% for CR, 45% for PR, and 19% for NR. Patient survival (Figure 3) was also greatest for patients who achieved CR and PR compared with NR (median 115 mo; P < 0.0001 and P = 0.03, respectively). Patient survival for patients with CR was also significantly better than for patients with PR (P = 0.01). The patient survival at 10 yr was 95% for CR, 76% for PR, and 41% for NR. Finally, patient survival without ESRD (Figure 4) was also significantly better for patients with CR and PR (median 99.9 mo) compared with NR (median 8.2 mo; P < 0.0001 and P = 0.0005, respectively). Patient survival without ESRD for patients with CR was significantly better than for patients with PR (P < 0.0001). The patient survival without ESRD at 10 yr was 92% for CR, 43% for PR, and 13% for NR. In addition, the patient survival without ESRD was similar overall for patients who initially were treated with plasmapheresis compared with those who were treated with standard therapy (median 132 versus 133 mo; P = 0.83). 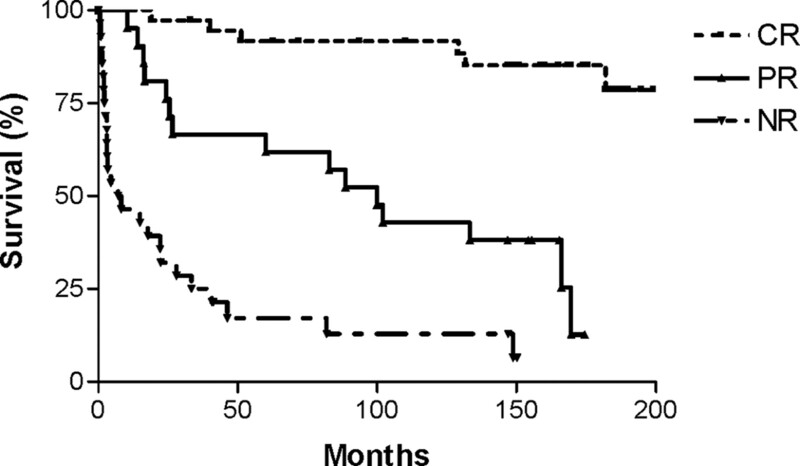 Renal survival (censuring for nonrenal death) in patients with severe lupus nephritis based on remission status. NR, no remission (P < 0.0001, overall; P < 0.0001, CR versus NR; P < 0.0001, CR versus PR; P = 0.003, PR versus NR). 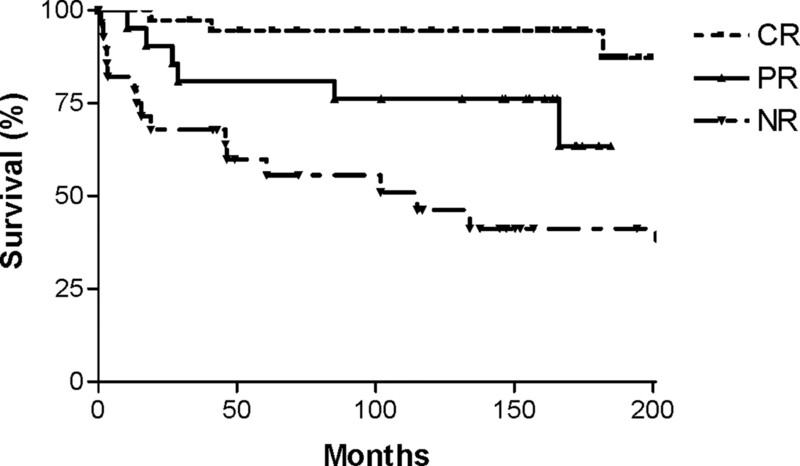 Patient survival in patients with severe lupus nephritis based on remission status (P < 0.0001, overall; P < 0.0001, CR versus NR; P = 0.01, CR versus PR; P = 0.03, PR versus NR). Patient survival without ESRD in patients with severe lupus nephritis based on remission status (P < 0.0001, overall; P < 0.0001, CR versus NR; P < 0.0001, CR versus PR; P = 0.0005, PR versus NR). We previously demonstrated that patients who had severe lupus nephritis and entered a CR, defined by normalization in renal function and proteinuria, with aggressive immunosuppressive therapy have an excellent patient and renal survival compared with patients with NR (6). In this study, we found that even patients with a PR, achieving a halving of proteinuria and have proteinuria ≤1.5 g/d and ≤25% increase in serum creatinine, also had significantly better outcomes than patients who did not attain a remission but not as good as in patients with CR. Patients who attained a CR had a lower serum creatinine at baseline compared with patients with a PR or no remission. In addition, patients with a CR had less advanced renal disease as demonstrated by a lower chronicity index. Otherwise, there were no differences in baseline clinical, serologic, or histologic features between patients who attained a CR or PR or NR. The goal of therapy in patients with proliferative lupus nephritis is the attainment of a response or remission in proteinuria given the excellent prognosis. Houssiau et al. (4) showed that the positive predictive value for a good long-term renal outcome is 90% in patient who have a reduction in proteinuria of 50 to 75% by 6 mo and 87% for patients with proteinuria <1 g/d. As we and others have shown, in patients who normalize their renal function (a CR), the renal survival at 10 yr is excellent (>90%) compared with 30 to 50% for patients with NR (2,6). CR rates vary considerable among studies of patients with proliferative or severe lupus nephritis, ranging from 10 to 85%. This variability most likely results from differences in definitions, therapeutic protocols, and patient mix. The goal of this study was to assess the impact of a remission (CR or PR) and not to determine the optimal therapeutic protocol. There is no agreed-on criteria to define response or remission in lupus nephritis. The definitions for remission, often referred to as complete, range from those that require a reduction in proteinuria to essentially normal levels <0.3 to 0.5 g/d (6,8,27–30) to those that require improvement to ≤1.0 g/d (9,31) and those that require only a ≥30% reduction in proteinuria to <3 g/d (32). In addition, renal function as measured by serum creatinine level must be normal in some studies (6,27), whereas in others, it must be “stable” (i.e., <30% rise in serum creatinine) or “improved” (9,28) or there must be a lack of doubling serum creatinine (31). In our study, we chose to apply the term CR to patients who achieved a normalization in renal function and proteinuria because the outcome for these patients is significantly improved over that for patients with NR. Few studies in severe lupus nephritis have assessed for the attainment of a PR. When evaluated, the attainment of a PR ranges from 10 to 50%, and, in this case, the definitions applied are even more variable (8,9,33,34). Some studies merely required proteinuria to be “fixed” or “improved” (9), whereas others required a 50% reduction in proteinuria (35), a 50% reduction in proteinuria to a level of proteinuria of 1 to <3 g/d (34,36), a 50% reduction in proteinuria to a level of 0.3 to <3 g/d (8,33,37), or a reduction in proteinuria to ≤1 g/d (29). Renal function requirements, although not always specified, include remaining stable or improved, ≥50% improvement from baseline, or lack of worsening from baseline of ≤25 to 50%. Unfortunately, none of these studies assessed the impact of attaining a PR. Using a definition of PR that requires a 50% reduction in proteinuria to ≤1.5 g/d and stable renal function, we found that 24% of our patients with severe lupus nephritis attained this level of response. Furthermore, we found that their outcomes were significantly better than those of patients who did not achieve these goals. These observations are consistent with the findings of Cortes-Hernandez et al. (5), who found that patients who had diffuse proliferative lupus nephritis and attained proteinuria of <2 g/d had a renal survival at 8 yr of 100% compared with 40% for those with proteinuria >2 g/d. Thus, attainment of a PR to the level of function as defined in this study has clinical benefit. The time to attaining a CR is significantly longer than that required to attain a PR, and this is expected given the more strict criteria for a CR. The average time to a CR in our study was 16 mo with a median time of 10.5 mo compared with a median of 5.8 mo for a PR. The timing for a CR is consistent with that observed by Chan et al. (8), whose patients entered a CR by 15 mo on average, and by Ioannidis et al. (32), who reported a median time to remission of 10 mo. On the basis of these observations, it is understandable why studies with only 6 mo of follow-up, such as that by Ginzler et al. (35), reported a low CR rate and relatively high PR rate. A number of features at baseline have been found to be predictive of a CR and these include race, level of serum, level of proteinuria, and chronicity index (6,7,34). In this study, we continued to find that patients who entered a CR had less advanced renal disease compared with patients with a PR or no remission; however, we were unable to find any features that could predict which patients would enter a PR because there were no significant differences at baseline between patients who attained a PR and NR. Ioannidis et al. (32) found that one of the most significant predictors of a failure to attain a remission is the delay in the time from diagnosis of nephritis to the initiation of therapy. A delay in treatment of >3 mo resulted in a 42% reduction in likelihood of attaining a remission in proteinuria (defined by a ≥30% reduction in proteinuria to <3 g/d). These observations emphasize the importance of early diagnosis and treatment. Although the favorable impact of a CR has been shown in a number of studies, no study before ours independently assessed the impact of a PR in severe lupus nephritis. The value of a PR in our study is consistent with that in other forms of glomerular disease, in which renal survival in patients with a PR is intermediate being less than that for patients who entered a CR but significantly better than that for patients with NR (10,11). The importance of maintaining a remission has been emphasized in patients with lupus nephritis because patients with renal flares are six times as likely to progress to ESRD as those without a flare (27). Although we found that the proportion of patients with moderate to severe renal flares was higher in patients with PR compared with patients with a CR, the outcomes were still significantly better than for patients who never entered a remission. Nonetheless, the increase in flares in patients with a PR and the poorer outcomes compared with patients with CR underscores the recent warning that PR should not be an end point that results in discontinuation of treatment (38). Rather, patients with PR, possibly even more than patients with CR, will require ongoing maintenance therapy to minimize flares and reduce the potential for progressive renal disease. On the basis of our therapeutic approach and definitions for remission, we found that even a PR in patients with severe lupus nephritis led to significant improvement in outcomes compared with patients who achieved NR. Despite this, the goal of therapy in severe lupus nephritis remains the attainment of a CR as defined by normalization of proteinuria and renal function because the outcomes for these patients remain far superior compared with those for patients with a PR. The finding that patients with CR have less advanced renal disease than patients with PR or NR stresses the importance of early detection and aggressive treatment of severe lupus nephritis. The Lupus Nephritis Collaborative Study Group included the following: Rush-Presbyterian-St. Luke's Medical Center, Chicago, IL: E.J. Lewis, J.L. Roberts, M.M. Schwartz, R.A. Rodby, and H.L. Corwin; George Washington University, Washington, DC: J.M. Lachin, S.-P. Lan, P. Cleary; William Beaumont Hospital, Royal Oak, MI: J. Bernstein, H. Shapiro, and B.F. Rosenberg; Cleveland Clinic, Cleveland, OH: M.A. Pohl, J. Clough, and G. Gephardt; University of Colorado, Denver, CO: T. Berl; Henry Ford Hospital, Detroit, MI: N. Levin; University of Iowa, Iowa City, IA: L.G. Hunsicker and S. Bonsib; Evanston Hospital, Evanston, IL: N. Simon and H. Friederici; Northwestern University, Chicago, IL: F. del Greco and F.A. Carone (deceased); Ohio State University, Columbus, OH: L. Hebert and H.M. Sharma; University of Pennsylvania, Philadelphia, PA: E. Nielson and J. Tomazewski; Tufts-New England Medical Center, Boston, MA: A. Levey and A. Ucci; Medical College of Wisconsin, Milwaukee, WI: J. Lemann (deceased), S.S. Blumenthal, and J. Garancis; New York Medical College, Valhalla, NY: K. Shapiro and P. Chander; West Virginia University, Morgantown, WV: F. Whittier, J.W. Graves, J. Bathon, and R. Riley. The Pathology Committee included the following: M.M. Schwartz (Chairman) Rush-Presbyterian-St. Luke's Medical Center, Chicago, IL; J. Bernstein, William Beaumont Hospital, Royal Oak, MI; G.H. Hill, Francis Scott Key Medical Institution, a Johns Hopkins Medical Institution, Baltimore, MD; K. Holley, Mayo Clinic, Rochester, MI.